This carnivorous theropod was first identified from two teeth found by Charles Deperet and J. Savornin at the African Continental intercalaire in Algeria, North Africa, in 1927. However, these were lost before the dinosaur could be fully described. It was originally named Megalosaurus saharicus until, with the discovery of more fossils in the Baharija Formation in Egypt , it was further described and renamed by Ernst Stromer von Reichenbach in 1931. Sadly, these bones were also lost; destroyed during World War II by Allied bombings of Munich , Germany in 1944. Then, in 1995, more fossils in the form of skull fragments were uncovered in the Kem Kem Formation in Morocco by Paul Sereno. In 1997, another, slightly larger species, Carcharodontosaurus iguidensis , was discovered by Sereno and his colleague Stephen Brusatte at the Echkar Formation in Nigeria but was not named until 2007. This carnivore was a true giant with a hugely muscular tail, massive body, and strong, heavy bones. It had short arms with three-fingered hands that were tipped with razor-sharp claws. 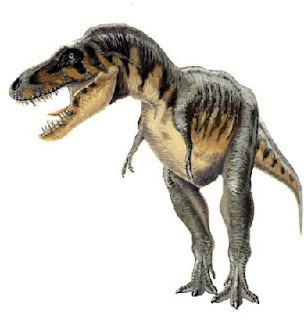 Although slightly larger than Tyrannosaurus rex , its brain was actually smaller, making it a more primitive dinosaur when compared to Tyrannosaurus . Like most of the giant theropods, it is unclear whether this beast was an active hunter, a scavenger, or both. It was certainly well equipped for the role of predator, but its large size may have made it too slow to chase down smaller, more agile prey. Most likely this dinosaur normally preyed upon medium to large sauropods and spent the rest of the time scavenging carrion or stealing other predators' kills. Whatever the case may be, during its reign Carcharodontosaurus saharicus was most definitely a much feared and very successful North African Allosauroid.